Decorative concrete has become one of the most desired options for basement floors, garages, patios, shops and restaurants. More than a floor coating, decorative concrete creates lasting beauty at a reasonable price, whether placed in a coffee shop or a basement. At Your Concrete Guy Co., we balance rapidly changing concrete technology with our customers’ individual needs and budgets. For example, we offer green soy etching as well as traditional resurfacing. We keep up with trends, so we can provide the safest, most reliable concrete service available at a fair and reasonable price. 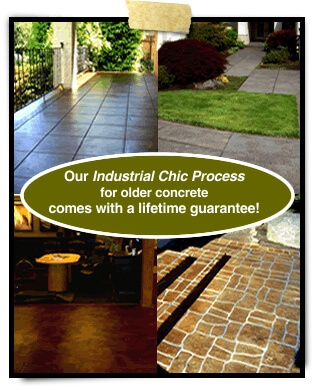 From restaurant floors to outdoor patios, we provide floor preparation, including asbestos tile removal, industrial epoxy application and floor maintenance — a full range of services for all our customers’ decorative concrete needs. Contact Your Concrete Guy today for more information or for an appointment to review our portfolio and discuss your ideas.